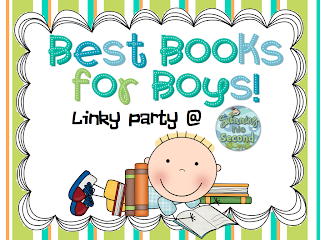 Courtney from Swimming into Second is hosting a linky about the best books for boys. I agree with everyone else about how difficult it is to get boys interested in reading. I currently teach second grade, but have taught first in the past, and sadly there is already a huge distinction between the genders and their passion for reading at such a young age. Generally, I have boys who are speed readers or reading all the way back at a beginning of first grade level and not much in between. It is always a challenge to get those struggling readers motivated. The boys in my class LOVE to carry around chapter books as though they are some sort of status symbol. However, most of them cannot actually read them yet so it isn't doing much for them academically! Mostly they are obsessed with Diary of a Wimpy Kid, although it is no where near their grade level! But for some reason they all own several... Some of the chapter book series they love are Magic School Bus, Bailey Street Kids, and A-Z Mysteries. They also like Flat Stanley and the spin offs from the original book. Recently, Geronimo Stilton has been a huge hit with all my kids. They love the different colors and fonts. My boys love nonfiction texts. I have done a pretty good job over the past few years at adding a lot of nonfiction to my library. What I do need more of though is leveled nonfiction for reading groups. Generally they like reading anything about snakes, spiders, insects, etc. They also like the Magic School Bus series and books about space and and other science topics. Scholastic has a "Who Would Win?" series that has been in their book clubs, so I have been ordering sets to use during reading groups. They are full of facts and great for teaching nonfiction text features. Of course, the boys love them! The easy reader biographies pictured below are available from Scholastic are great too because they are at an end of first/beginning of second grade reading level. They are most interested in reading about people we have already learned about. This year my boys were a bit more engaged in our poetry unit as well, which I was happy to see. 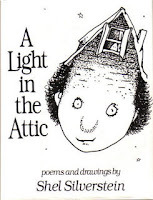 I think they loved the humorous poems that were available to them by Shel Silverstein and Jack Prelutsky. I bet they'd also love joke books or something of that nature as well. Another topic that I know they still love is superheroes...I need to look into getting some comic book type reading material for them. Last thought, my boys this year love magazines as well. I have a subscription to Zoobooks and have a ton of older ones as well. This is a great topic. Don't forget to link up with Courtney from Swimming into Second. She is also offering a $25 Amazon gift card giveaway as well. Thanks! I just started following you and saw you get to loop from kinder to first. I did that once from first to second and loved it. Good luck heading back to school next week! Thanks for linking up Jessica! Those "Who Would Win" books look like a good choice. Thanks for hosting Courtney. These linky parties are a great way to introduce myself to the blogging world. Hey there! Welcome to the bloggie world. Great post. My boys love Who Would Win!! I teach 3rd Grade Reading in TX. You have some great suggestions in your post! And definitely look for some of the superhero/Star Wars type "readers" ... the boys eat them up! For struggling readers ... definitely Fly Guy. Piggie and Elephant. Bones. A new book we're loving is Frog and Fly by Jeff Mack.